After a couple of years, you get to a point in your young parenting life when you relinquish the ideas of your former self. Last year I converted my old work/workout area into a inspired writer’s nook. A lovely thought, right? Over a year later, I believe I wrote from that spot a total of three times. If I got a chance to work on my writing, it was likely at the dining room table in between making dinner, doing some work and cleaning up crayons. Our once adult basement slowly transformed. With large plastic toys cluttering the basement TV viewing area, the man cave part of the basement was a man cave no more. So I threw up the white flag. Mommy surrender. My once serene writer’s nook has been transformed into a toddler’s playroom. The sacrifice was worth the reward. We now have friends over to watch a game while the kids quietly (or not so quietly) play right behind us, and we know they are safe. I plan on showing the full playroom in weeks to come when I finish the cute sporty touches, but for now, I wanted to share a little fun art corner addition. Our toy room is sectioned off by two three foot tall walls that divide the room. 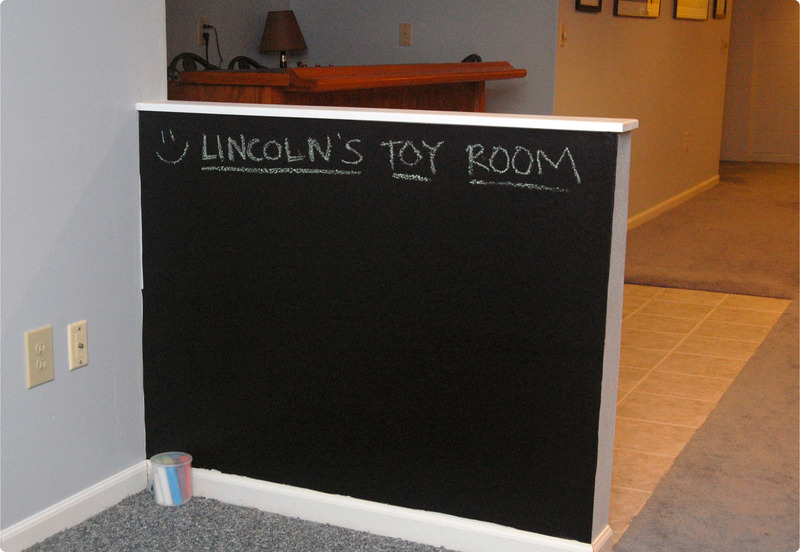 I decided it was the perfect height and length to turn it into a chalkboard wall for Lincoln and his friends. Originally, I just planned on painting the wall, until I discovered chalkboard contact paper. Much less fuss, much less smell, much less mess and hopefully easier to clean up if I decide I do not want it anymore. I ordered the contact paper through Amazon. I needed two rolls to fill our wall space. It is easiest to have someone help you to reduce the amount of bubbles in the paper. The process is pretty simple. Cut your paper to the length of your space (I made mine a little longer and cut it off at the end). Peel of the back of the contact paper. Starting at the top of the wall, press across then down. Continue this until you reach the bottom. Pull downward and a little bit outward with the paper to avoid bubbles. Use a credit card to smooth the paper and adhere it to the wall. Cut the extra edges (if you have any) with a scissors. 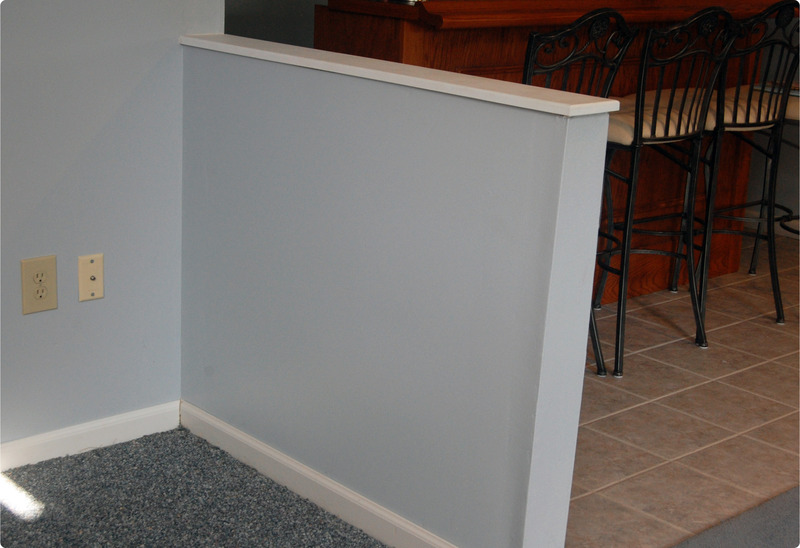 If you have any small overlaps over molding or at the corners, take an Exacto knife and simply slice off the extra pieces, being careful not to slice the wall. Repeat with as many pieces as you need to fill your space. Make sure to line up your paper and make as few seams as possible. Lincoln was very excited to get to play on his new chalkboard wall and I am happy as a clam typing with my Mac in my lap or on the table. Life may not be what it used to be, but life is pretty darn good. I’ve got something cooking for the other side, which I will share in the future. 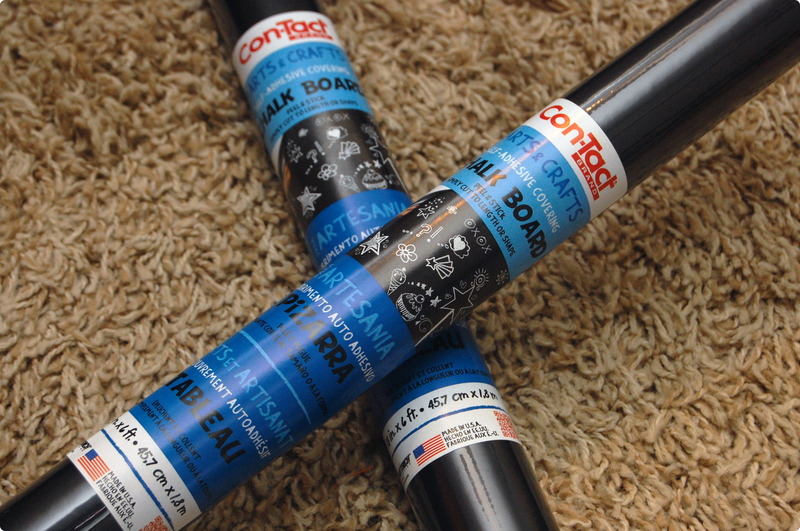 I plan to use the leftover contact paper for some fun projects too. Stay tuned! this is awesome – so fun! it was so nice to meet you last week!! i hope we can chat again soon. Thanks! It was great to meet you too! Hopefully we will meet up again!